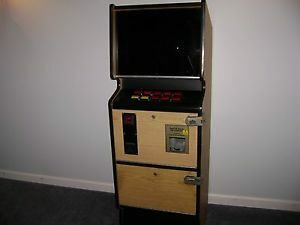 Vintage 1940’s trade stimulator penny slot gumball machine. 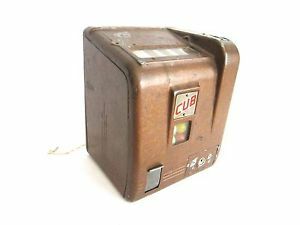 Made by the Davel manufacturing company in 1940 the CUB trade stimulator was one of the smallest slot machines ever made. 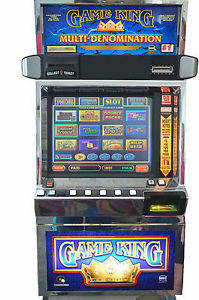 It displayed graphics of cigarette packs on the reels but officially dispensed gum to the lucky winner. 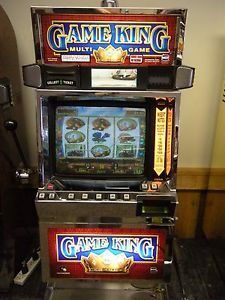 The cigarette packs advertised on this tabletop slot machine are Lucky Strike, Camel ,Chesterfield and Pall Mall. 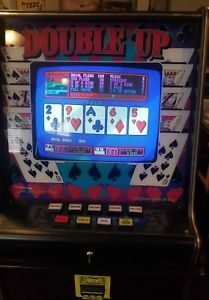 It appears to be missing a fold down metal display chart which hinged on top which was meant to disguise the fact that it was in essence a gambling device. There are two part numbers embossed into the inside of this 1 cent machine, C 6 005 and on the bottom 47004. The Cub stimulator has its keys which open the back and the front to retrieve the cash. 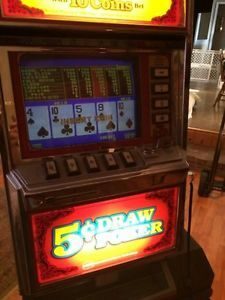 Not only is this gumball machine a rare survivor of gambling history and a great addition to your penny slot trade simulator collection but it can still be used as a simple form of entertainment. 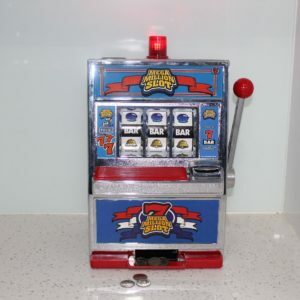 Slot machine measures 5“ wide by 5.5“ deep by 6.5“ tall and weighs almost 5 lbs. In good working condition with signs of use commensurate with age, scuffs and paint loss. It may be missing an advertising piece from the top (please see all pictures as they form part of the condition description). Payment is due immediately. I am a reasonable person and as long as the communication channels are open and clear, I have no problems accommodating special circumstances. I reserve the right to sell or re-list items not paid for within 48hrs. We ship within 1 business day after receipt of the payment. Each item is packed very carefully to make sure it gets to you in excellent condition. Each package comes with a tracking number. I will combine shipping, please request an invoice after you have purchased multiple items. 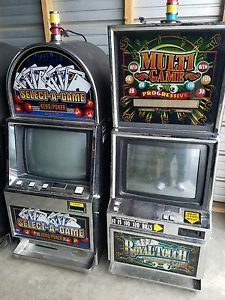 Large Items (listed as Pick Up Only), collection must be within 14 days of purchase. I am a reasonable person and as long as the communication channels are open and clear, I have no problems accommodating special circumstances. In the absence of communication about pick-up the item will begin to incur storage costs after 14 days at a rate of $25 per day. Once the value of the item has been exhausted through storage costs, I reserve the right to relist and re-sell the item. Our pick up zip code is 90041, Los Angeles and it is a home address. As most of our items are vintage and used they are sold as is and we only accept returns for mailed items. If you are unhappy with your purchase we will accept a return if it is mailed back to us (at your cost) within 14 days. Assuming it is returned in the same condition it was sent and returned within 14 days, we will provide a full refund. For items that are picked up or collected, we do not provide refunds. Once your item leaves our warehouse, it is no longer our responsibility, and any damage during shipping must be handled by making a claim through the shipper. We will of course provide an invoice or bill of sale, etc, that may be needed for you to file your claim. We are happy to help assist in any way we can and look forward to your questions. I find new and wonderful treasures all the time so if you are looking for something specific – let me know or if you have any general questions don’t hesitate to shout. For faster service, please feel free to call me on (415) 990-1290 during business hours, 10-5 PST. I also purchase inventory regularly so please do contact me if you are looking to sell any antiques, estates or collections.